As a global capital goods leader, with a commercial presence in approximately 180 countries around the globe and 66 manufacturing plants, designing, manufacturing and selling agricultural equipment, construction machinery, trucks, buses, specialty vehicles and powertrains, CNH Industrial seeks, through a number of initiatives, to minimise the environmental impact of logistics processes. Tweet This! This case study is based on the 2017 Sustainability Report by CNH Industrial published on the Global Reporting Initiative Sustainability Disclosure Database that can be found at this link. Through all case studies we aim to demonstrate what CSR/ ESG/ sustainability reporting done responsibly means. Essentially, it means: a) identifying a company’s most important impacts on the environment, economy and society, and b) measuring, managing and changing. In its 2017 Sustainability Report CNH Industrial identified a range of material issues, such as circular product life cycle, CO2 and other air emissions, renewable energy, self-sustaining food systems, employee engagement. Among these, reducing the environmental impact of logistics processes stands out as a key material issue for CNH Industrial. To identify and prioritise material topics CNH Industrial received feedback, through an online survey or direct interview, from a sample of 1,247 stakeholders that included employees, customers, dealers, opinion leaders, public institutions, NGOs, investors and journalists. 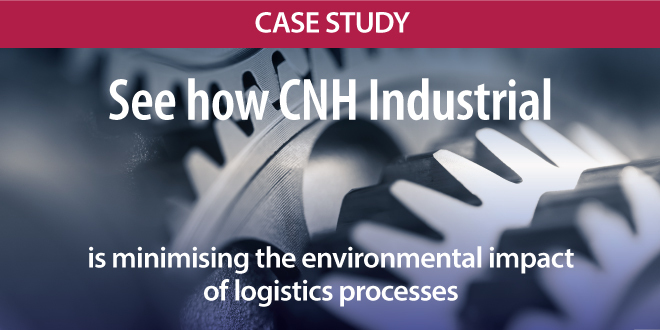 What actions were taken by CNH Industrial to reduce the environmental impact of logistics processes? CNH Industrial seeks to reduce emissions from the transport of components and finished products by using road vehicles that conform to the strictest environmental standards. In Europe, CNH Industrial has gradually introduced specific environmental contractual clauses that oblige external transport providers to use vehicles that comply with Euro IV standards or higher. In North America, CNH Industrial engages logistics partners in the SmartWay transport programme. This programme is sponsored by the Environmental Protection Agency (EPA) and aims to improve efficiency and reduce greenhouse gas and air pollutant emissions in the transport chain. Participation in the programme is one of the factors CNH Industrial takes into account when evaluating potential suppliers and, in 2017, 93 per cent of service providers (rail and road transport) participated in the programme. CNH Industrial promotes alternative modes of road transport through intermodal solutions, to reduce both traffic congestion and CO2 emissions. In 2017, critical components (coloured plastic parts, metal sheets) were shipped by sea from Italy to the plants in Madrid and Valladolid (Spain), thereby reducing CO2 emissions by 3,234 tons. CNH Industrial also used the intercontinental flow by rail between East Asia and Europe to move finished goods (engines) in the opposite direction, from Italy to Japan. In Europe, finished goods and components were moved by rail between plants in Southern Italy and the North, with almost 270 train journeys in each direction in 2017. CNH Industrial optimises transport capacity to reduce the costs and environmental impact of transportation. The company makes both technical and organisational changes to routes and volumes to optimise and streamline the whole process, including environmental impacts. In November 2017 a new project began, to optimise the transport of cabs from the plant in Valladolid to the one in Madrid (Spain), using new 21.5-meter megacamiones (mega-trucks) instead of the standard 13.6-meter semitrailers. This initiative reduced the number of trips by 28 per cent and CO2 emissions by 77 tons. In 2017, CNH Industrial continued to monitor, through the World Material Flow (WMF) programme, the quantity of cardboard and wood used in consolidating shipments of materials by sea to plants in Australia and North and South America. As a result, fewer wood crates were used, reducing the amount of wood shipped by approximately 99 tons (4.13 per cent).